This four-part series will detail the research that students and faculty have completed through the Jill Barrett Program. Part Two of the series details research completed by Jillian Steele and Simmone Dyrness under the Principal Investigator (PI) Susan Spiller, on tagging actin and tubulin with Bioengineered fluorescent protein tags derived from Cyanobacteriochromes. These fluorescent protein tags basically act as a glow stick inside a cell, allowing scientists to view the skeleton of a cell. This is exactly what Spiller and her team are trying to accomplish on a cellular level. This new red fluorescent tag the team is trying to engineer will allow scientists to zoom into the cell, just like Google Earth, only what they are looking for will have the bright red light, or tag on it. The team is looking at two proteins that make up the cyoskeleton of a cell: actin and tubulin. These two proteins work individually and together to move molecules and vesicles around inside cells, but the mechanism of how they do it is not well understood. Spiller has lead groups, called Biophotonics teams, in this ongoing research, developing the project for the past 12 years. The team hopes to engineer a simple and successful way to tag actin and tubulin without damaging the cell and then use this tag to discover how such proteins work. Each year new students form a Biophotonic team, which builds off of the previous team’s project. General research goal: To develop a small, red fluorescent protein to label actin and tubulin proteins of the cytoskeleton (photo courtesy of Susan Spiller). Why label tubulin? Labeling tubulin would allow scientists to see what these crucial molecules are doing inside living cells. Looking through a microscope, scientists would be able to distinguish between the roles of tubulin cytoskeleton (internal cellular skeleton) fibers and actin cytoskeleton filaments. Both actin and tubulin play important roles inside cells by interacting together and separately when controlling what goes in and out of the cell. Spiller’s team is questioning exactly what tubulin and actin do inside a cell. Jillian Steele and Simmone Dyrness, two students who worked with Spiller in her tag research through the Barrett program, said the experience they gained through the program was extremely useful. 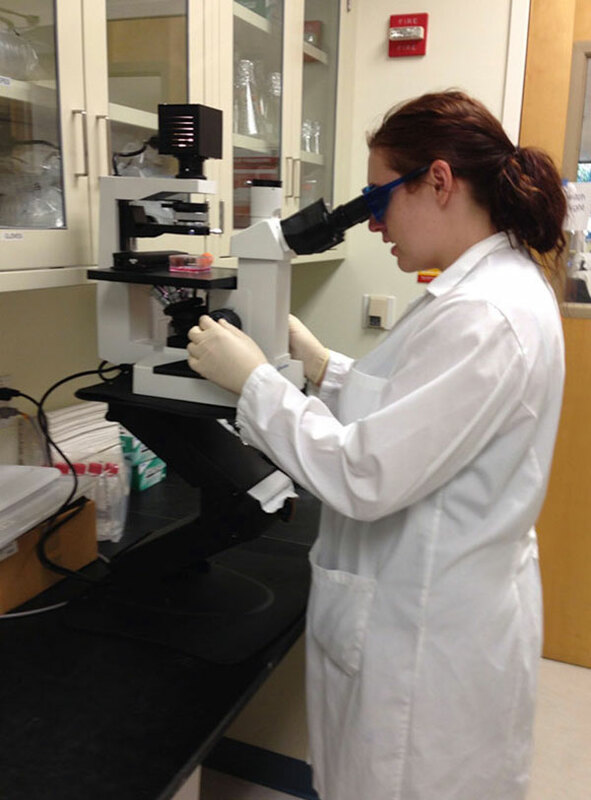 Jillian Steele working in the lab at Mills College, taking a closer look at cells (photo courtesy of Jillian Steele). 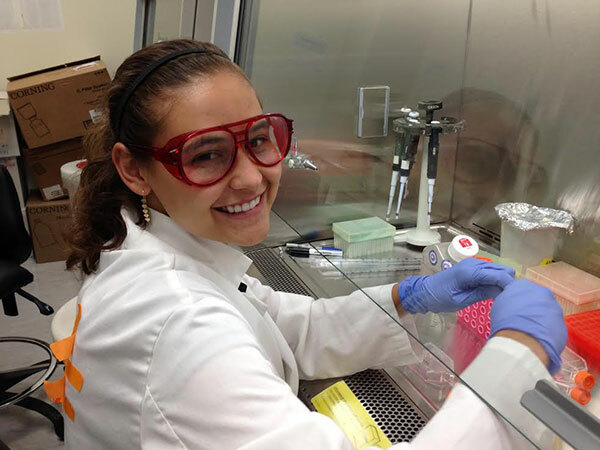 Steele is majoring in biochemistry and molecular biology, and focused her research on the overall question of how tubulin and actin work, how they control what goes in and out of the cell, and how they differ in function. According to Dyrness, a Mills alum who studied biology in the Barrett program with Steele and Spiller, most of the fluorescent tags on the market currently don’t allow for in vivo tagging, or tagging living cells, because they are extremely damaging to the cells, eventually killing what they are tagging. “The advantage of our tag is we can use it to see what happens in the cell naturally without disturbing or hurting it in any way,” Dyrness said. A closer look at performing cell future on HEK293T cell with Simmone Dyrness (photo courtesy of Jillian Steele). So far, as a collective, the team has contributed to the engineering of cyanobacteriochromes, a light sensitive protein that uses its sensors to find where it can get the right quality of light to do photosynthesis; and used a bacterium that utilizes light detector capabilities to absorb its food to make their tags become red fluorescent. Cyanobacteriochromes are found in photosynthetic (the process of converting light energy to chemical energy and storing it in the bonds of sugar) bacteria, some of which live in hot springs. Spiller’s team took their source, genomic DNA, from Thermosynechococcus elongates, a kind of bacterium that has several cyanobacteriochromes with an ability to fluoresce far-red light. In the past, fluorescent tags have only been blue, green or orange, but this new red tag the team created makes the molecules’ location visible inside living cells. So far scientists understand that tubulin fibers play a role in moving molecules and vesicles around inside of living cells, but little is know about the mechanism in which they move. “We basically created a glowing label so that we can visualize the cytoskeleton of the cell,” Dyrness said. Before this new research, fluorescent tags were created using proteins from jellyfish. These had limited imaging potential and were subject to photo bleaching, which is when a tag fades over time after exposure from light from taking pictures of it. In time, jellyfish protein tags stop glowing altogether after light exposure. These tags also had longer amino acid sequences and produced reactive oxygen molecules, which would injure the cells. Small Red Fluorescent Protein Tag (photo courtesy of Susan Spiller). This new red tag is created using proteins from cyanobacteria; it produces a brighter red hue to longer wavelengths. These longer wavelengths create better imaging compared to fluorescent tags derived from proteins of jellyfish. The teams new cyanobacteria tags are not subject to photo bleaching, which means the light will not fade in and out while the microscopist is watching. Longer wavelengths are useful because you can take images through deep tissues in the body, allowing scientists to view images through many layers, according to Dyrness. Cyanobacteriochrome derived tags are smaller because they have shorter amino acid sequences and therefore do not disrupt the normal activities of a cell. Big Picture: The goal is to create a tool that scientists can use the way they use current market protein tags. This would allow scientists to utilize an invaluable tool in their own research to elucidate the bigger questions scientists are asking today. Eventually the team would like their tag to be used to determine how viruses attach and inject their DNA into a cell (like HIV), which would allow insight into how to solve the diseases it causes. These types of tags can also be used for marking tumors for doctors so they can better identify what is healthy and what is damaged tissue. Future goals: Create a plasmid that contains their tag and attach it to tubulin once inside the cell. So far the team has accomplished this task for actin and is working towards their goals for engineering and applying tubulin tagging.